Scheduling social media content can save you tons of time, and if done correctly is a great way to boost engagement. 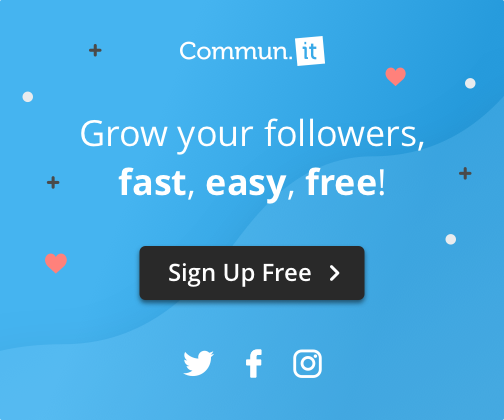 Want to Grow Your Twitter Community? Join over 1 million users today, it's FREE. 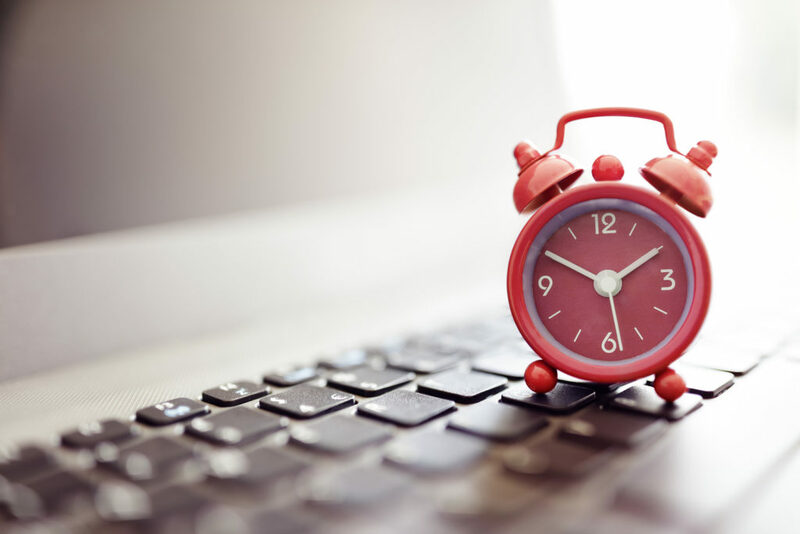 When it comes to social media, scheduling content can save you tons of time, and if done correctly is a great way to boost engagement. But to really see results, you need to be smart about the way you schedule your social media. Our Weekly Scheduled Messages make it easy to plan your content ahead of time, and can help you target the most relevant members of your community. In fact, this is one of the most efficient ways to grow your community and generate meaningful engagement. Weekly Scheduled Messages is one of our main features because we see scheduling content as an integral part of effective social media management. We launched this feature as a way to alleviate the daily demands of social media. After all, it’s simply impossible keep an eye on all your social networks every minute of the day. It’s our hope that this sophisticated scheduling feature will save you time and will take the guesswork out of community management. What are Weekly Scheduled Messages? Our Weekly Scheduled Messages feature enables you to schedule tweets for specific segments of your Twitter community. 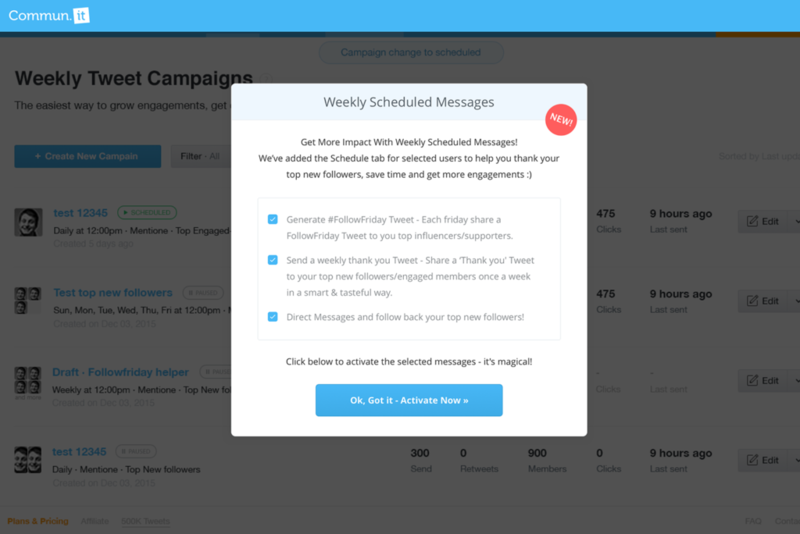 In addition to saving you time and giving you the opportunity to plan your content ahead of time, this feature makes it possible to send targeted messages to relevant users. The targeted and highly customized nature of these tweets makes them effective as an engagement boosting tactic. 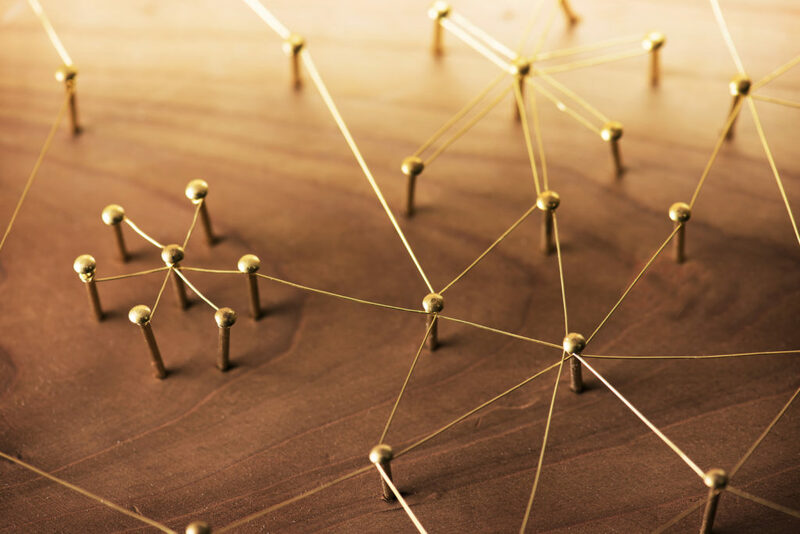 Weekly Scheduled Messages can be sent to different members of your community from top influencers and top engaged members to top new followers. There is also the option to send a recurring tweet which isn’t targeted and will be sent to your entire community. How can I activate Weekly Scheduled Messages? Weekly Scheduled Messages are easy to activate under the ‘Schedule’ tab. When you first click on this tab, you’ll be asked to activate campaigns (see below). Note that once you do this, a few generic campaigns will be set to run. We recommend that you review these campaigns, edit them accordingly and pause the ones that aren’t relevant. Activating campaigns is as simple as that. But don’t stop there. For best results, it’s important to tailor campaigns to suit your audience and unique marketing needs. How can I customize Weekly Scheduled Messages? You can edit an existing campaign by clicking the ‘Edit’ button to the right of the campaign. The other option is to create a new Weekly Scheduled Message by clicking the ‘Schedule New Message’ button. Both the ‘Edit’ and ‘Schedule New Message’ buttons open a page where you can customize Weekly Scheduled Messages. If you’re creating a Weekly Scheduled Message from scratch, we recommend giving the message a name. This is an internal label which will help you easily locate the message and differentiate it from others. Next it’s important to decide which community members your message is targeting. For example, you can choose to target Top Engaged members, Top Influencers or perhaps Top Retweeters. Keep in mind that you can only target one segment of your community per message. It’s also important to decide on how frequently you want this message to be sent. You can either send it daily or weekly. If you choose to have the message sent weekly, you can select the specific days you want the message sent. Feel free to activate as many Weekly Scheduled Messages as you want. Our algorithm will automatically regulate the frequency these messages are sent according to your posting schedule. This means you never need to worry about overwhelming your Twitter community with Weekly Scheduled Messages. Now it’s time to customize the actual message that will be sent. We highly recommend tailoring this message to suit your target audience. This not only ensures that the message is more relevant, but is one of the best ones to boost engagement. Add an image: An easy and effective way to customize Weekly Scheduled Messages is to add an image. You can add an image to all messages except to Direct Messages. Feel free to get creative with the image. Your followers are more likely to react to an image which makes them look twice. It’s also a good idea to choose an image which compliments your text (see example below). Experiment with how you start messages: By moving the <users_list> text to the front of your message (see the example below), your message will be more private. This means that instead of appearing as part of your main Twitter feed, it will appear under the Tweets & Replies Twitter feed. This simple tactic makes it easier to target relevant community members and helps keep your Twitter feed clean and relevant. Pay attention to the message preview: Before scheduling your message, be sure to review the message preview which appears at the bottom. This will give you a good idea of how the message will appear when sent. You can make any final changes to the message by clicking on the text box above. Remove the Commun.it from messages: With Commun.it’s premium plans you have the option to remove the Commun.it link. When used correctly, Commun.it’s Weekly Scheduled Messages are a powerful tool for boosting engagement and streamlining community management. What tips do you have for getting the most out of Weekly Scheduled Messages? Share your suggestions in the comments below.